So this sounds amazing – we all want to optimize our students’ learning…how do we do this?! I’m going to share with you a few examples that I’ve been working within the classes I’m currently teaching. Grade 6: We are working on developing strategies for mental fluency in multiplication. 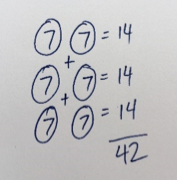 We have been working on creating strategies that would allow students to mentally compute a fact that they either have forgotten or don’t know readily. An example that some of the students came up with is 6 x 7. 3 groups of 7 plus another 3 groups of 7. You can see that this is a blend of a pictorial model with symbols but what it allows students to do is actually visualize the strategy of finding 3 groups and then doubling it. 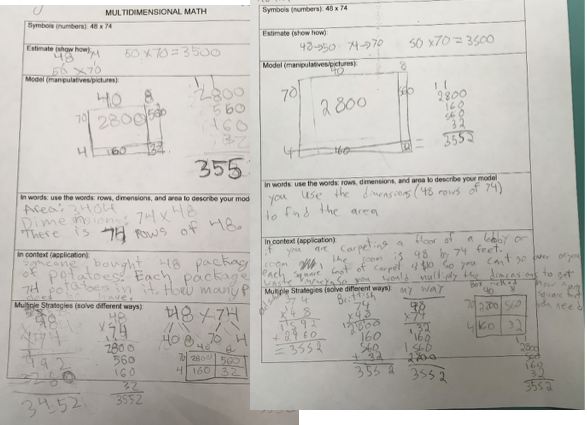 Although these ways are similar, the idea is to allow the students to explore working with partitioning and understanding how numbers can be broken down to simplify mental calculations. This is also an important pre-algebra skill as this relates directly to this: (which they will learn about when they get to high school). 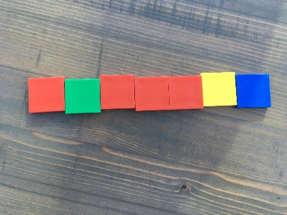 Students are now integrating their understanding of dimensions (length and width) with area and how this is directly related to multiplication of two numbers. Furthermore, they are now better able to visualize the areas of these large rectangles and so their estimates have also been getting more accurate. The students struggled most with understanding the length and width in terms of ‘rows of’. For example: 27 x 45: the dimensions are 27 by 45 and what that really means is 27 rows of 45. In both of these examples, the students could have improved their models by showing 48 rows of 74 rather than 48 columns of 74 and by drawing their sketches more to scale. Students were given feedback on their sheets and we looked at several students’ responses of excellent answers and then they had more opportunities to improve on their understanding and representing it clearly. The regular classroom teacher told me today that the difference in his students’ understanding of multiplication from when he taught this traditionally (procedurally) to how we taught it visually was night and day – he was blown away by how much they improved AND the added bonus of learning about shape and measurement at the same time, not to mention the struggling learners were finally understanding and succeeding! My last example is from grade 8, where we were exploring square numbers and square roots (including estimating). 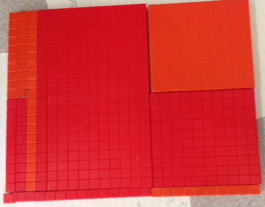 Before we moved into this lesson, we were reviewing factors (among other things) by using square tiles to build rectangles with different areas and exploring how many rectangles (including squares) we could make for each number. For example: using 12 tiles to build a rectangle (filled in – so the area is 12). This way we could discuss how each number has a certain number of factors (prime and composite numbers are easily recognizable as having either one rectangle only for prime numbers or many rectangles for composite numbers). If the area is 12 then…. If the area is 7 then…. This made the whole idea of square numbers extremely easy for them – they are simply numbers that make a square! We connected the concept of a square root to the side length. When we moved forward into estimating students used number lines with the perfect square numbers as ‘bookends’ to estimate the approximate square root (side length) of squares with various areas. For example: a square with an area of 50 would have approximate side lengths of 7.1 because 50 is so close to 49, whereas a square with an area of 30 would be more in the middle of 5 and 6, so 5.5 because 30 is about the middle of 25 and 36. 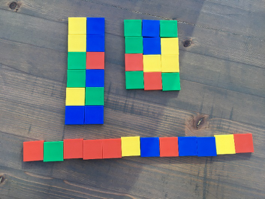 Using visuals, both the square tiles and the number lines allowed students to be able to make accurate estimates in only two lessons of exploring. They worked in teams so they could teach each other their own ways and, by the end, every student could write to explain their understanding of what square numbers were and how to find them, what square roots are and how to find them and approximate them for non-square numbers. When I used to teach this traditionally (symbolically only) as 32= 9 and = 3, my students would forget in a day or two and inevitably think 32 = 6….they only memorized the rule but had no understanding of what it means to square a number and certainly didn’t have a visual that they could use to help them solve problems involving square numbers. Try it for yourself! Think about how you can explore the concept you’re currently working on visually (for help we have videos and lesson plans that show you how to do this). Please share your ideas in the comments section so we can collectively build more visual tools and strategies for math concepts. I always tell my students “Seeing is Believing! Previous PostPrevious What Do You Do When Your Students Hate Math?